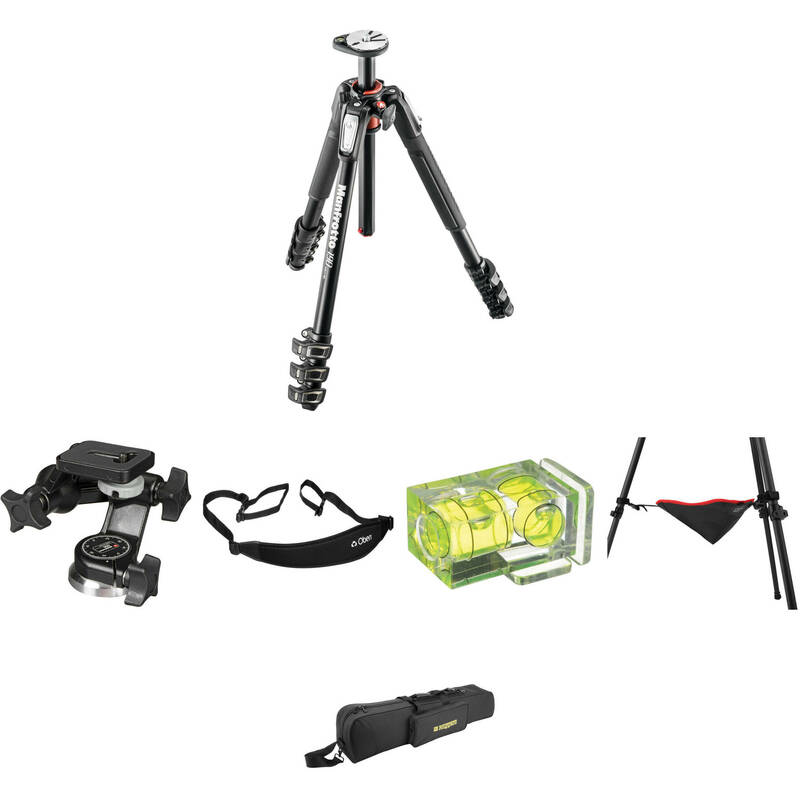 This Deluxe B&H Kit consists of a Manfrotto MT190XPRO4 Aluminum Tripod with a 056 3-D Junior Pan/Tilt Head. Also included in the kit are a tripod strap, tripod case, bubble level, and stone bag. These accessories will both help protect your tripod, and make it easier to capture quality images. The tripod can hold 6.6 lb of gear, and extends from 7.2" to 67". The tripod folds down to 23.2" for transporting it in the included padded case. It features a Quick Power Lock System that allows you to completely extend the tripod legs with just one hand. Once set up you can use the MT190XPRO4's rapid center column in standard vertical mode or swing it into horizontal position like a boom with Manfrotto's 90° column feature. Enlarged tabs on the individual leg angle selectors allow you to get down to only 7.2" for macro work with the column in horizontal mode. And once you're down there you can attach any of Manfrotto's flexible or articulated arms to hold lights or reflectors via the Easy Link plug built into the tripod's spider. The 3-way pan/tilt head has separate locks for each axis, and conical self-adjusting bearing surfaces on the tilt pivots provide the strength to hold up to 6.6 lb. The head has 360° panning, -30° / +180° front tilt, and -180° / +30° lateral tilt. The 056 3-Way, Pan-and-Tilt Head from Manfrotto has a load capacity of 6.6 lb and can be attached to tripods or other support systems that feature a 3/8"-16 mount. Cameras or accessories that are compatible with a 1/4"-20 mount can be connected to the head's rubberized, non-slip platform. The head can be rotated 360°, and tilted 180° forwards or 30° backwards, as well as 180° sideways. Each of these three movements function independently of each other and can be locked into place. To promote fast and repeatable device positioning, this 056 3-Way, Pan-and-Tilt Head also includes a dedicated angle scale for rotational movements that is designed for easy visibility. Box Dimensions (LxWxH) 5.2 x 5.0 x 3.6"